Students attend a weekly class of 40 minutes throughout the school term. There are 4-6 students per class and students are grouped according to their availability and level. We start from the age of 5, before 5 they are prepped for learning an instrument in our Stassi Kids Music program. We also have a dynamic group for high school students. A combination of sight reading and playing by ear are taught. We keep classes fun but also educational. We show each student how to work independently thus making it easier to practice at home. Our aim is to kindle the love of music making it something your child will continue with into adulthood. We have a weekly theory class of 40min. 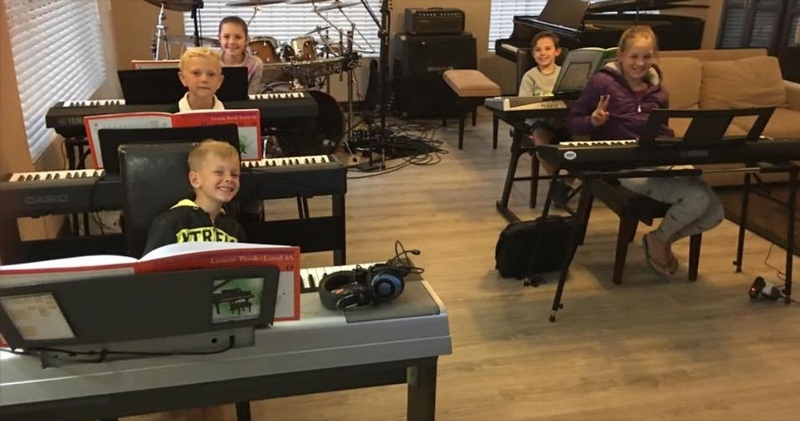 In this class we teach the elements of music which is the writing of key- and time signatures and rhythmic- and melodic notation. Selected students of Stassenheim Music can join for free. Students not enrolled with us can join for a fee per term. Please bring your own headphones for piano classes. We have headphone adapters at the studio. Some piano & violin books are available at the studio. Please contact us for pricing and book recommendations. 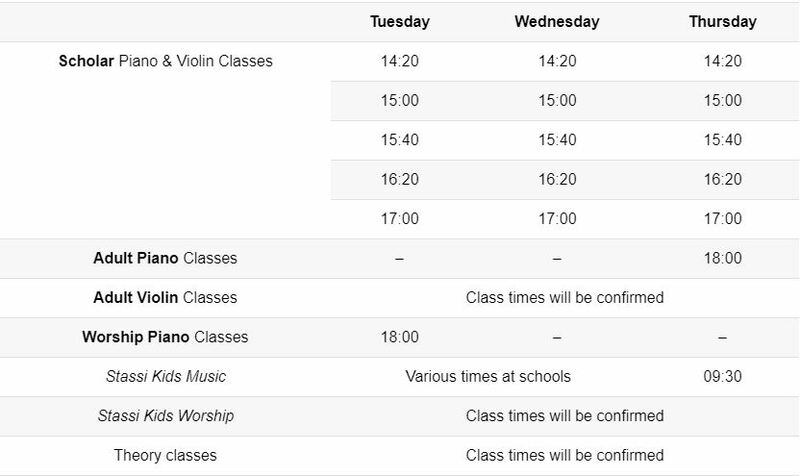 We will recommend a violin size and keyboard/piano type after your first class. We can assist students with buying and/or hiring of instruments as well as comprehensive insurance thereof. Transport can be provided for scholars during the weekday afternoons. A minimum of 4 students in the same time slot per school is needed. Transport is only provided within the 2km catchment area of our studio. This includes Laerskool Hennopspark and surrounding after-schools etc, but can be extended to other schools if needed. Transport is invoiced as an extra cost per month per student. 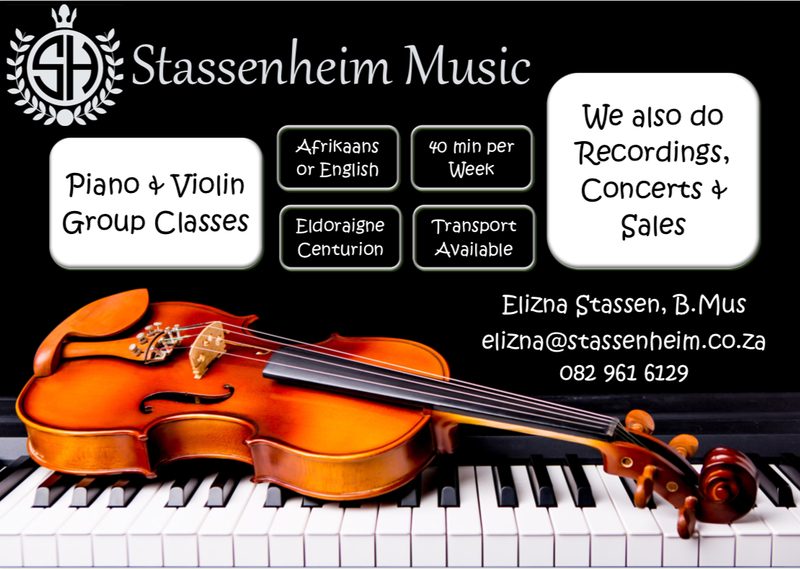 We have separate rooms and tutors for violin and piano classes thus classes can take place at the same. Students are grouped according to their availability and level. A minimum of 4 students per class needed to open a time slot. Please let us know if you have another preferred time and we can attempt to open another slot. We are also available in the mornings. There are no classes during school holidays or on public holidays. Classes that are missed are forfeited and cannot be rescheduled. 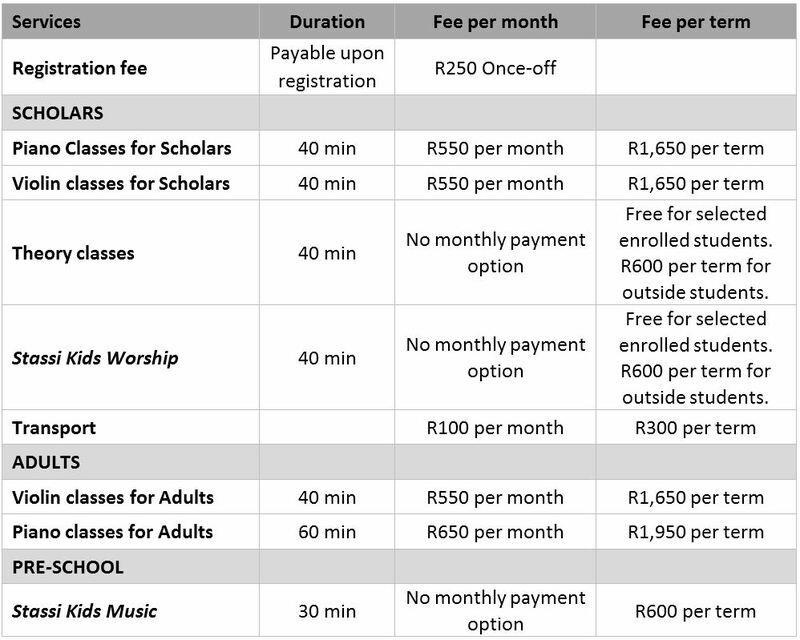 A once-off registration fee of R250 applies when a student enrolls at Stassenheim Music. This fee is to reserve a time-slot and is payable before classes commence. There are 2 options available for payment of class fees: Monthly or per Term (3 months in advance). Monthly class fees are payable over 12 months in advance before the 5th of each month, starting from the beginning of January 2019 up the beginning of December 2019. Class fees per term are paid in advance before the start of each school term. Classes can only be attended if the monthly/term fees were received. Please settle your class fees via EFT and select the option where the bank sends a notification of payment to using the student’s name and surname as reference. Fees are non-refundable and the payer does not receive a refund if the student ceases attendance or misses classes. Should a student wish to cancel his/her enrollment, a written notice and payable notice period of two months is required. Send us an email, Whatsapp or SMS or leave us a message through our website. @ Copyright 2017 Stassenheim (Pty) Ltd. All Rights Reserved.